History was made on Saturday 14th November, 2009 in Port Harcourt the Rivers state capital with the formal presentation of Waste management equipment to the Rivers State Government by Albayrak Group Turkey for the kick off of a Waste disposal pilot scheme in the D-Line area of the state. The Project is the Brain child of Prince Tonye Princewill, AC leader in the state who because of his business capacity also serves as Consultant to the Rivers state Government on Public Private Partnership investments. 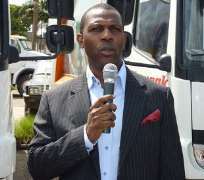 Having noticed that waste management and disposal was increasingly becoming a major problem in the under-serviced areas of Port Harcourt City, resulting in trash lining the city streets which was not only depressing but constituting an embarrassment to a state that was being commended for its urban renewal development plans, Prince Tonye Princewill considered it expedient to combat this scourge. His search for a workable model of urban waste disposal for the city of Port Harcourt and its environs saw him undertaking studies that had him visiting major cities within and outside Africa before his decision to settle with the Albayrak Group Turkey, a world renowned conglomerate with Head Office situated in Istanbul. The remarkable thing about the pilot scheme is Albayrak's offer to provide services for this phase at zero cost to the Rivers State government. No contractual agreement was involved in the freight and clearing of no less than thirteen mega waste trucks, over 160 large waste disposal bins and other sundry equipment that arrived the State. The cost of the pilot phase that is scheduled to be carried out in the over a period of 1 month will also be written off by them. The Group is optimistic that at the end of the exercise an assessment that would hopefully lead to its engagement as official waste managers of the State would be carried out. Present at the at the brief presentation ceremony held at the State Secretariat, Port Harcourt where Barrister Kingsley Chinda, Honourable Commissioner for Environment and Dr.Harrison Ofiyai, MD/CEO of Albayrak Africa. Receiving the equipment on behalf of the State Government, Barrister Chinda expressed delight at the prospect of a massive improvement in the sanitary conditions of Port Harcourt and commended Princewill for facilitating such a worthy initiative. He stated thus “...I am happy that such a great partnership is coming onboard during my tenure as Commissioner for Environment and most especially under the stewardship of our Governor Rt. Hon. Rotimi Amaechi... As with every other worthy initiative of this administration, it is being done in good faith and I hope that if eventually fully adopted, it would not only outlive this administration, it will also be on the front burner of subsequent ones.” In addition, Chindah urged residents of D-Line to cooperate with Government and its soon to be visiting enumeration team and fully comply with waste collection directives and instructions to ensure an enabling environment for them to operate in. In his own remarks, Dr. Harrison Ofiyai thanked the Rivers State Government for affording his company the opportunity to have an in-road to Africa through Rivers State. An indigene of both Bayelsa and Rivers States who has lived most of his life outside the country, he confessed that most of the credit for this venture must be given to Princewill who played a major role to convince him and by so doing the Albayrak Head Quarters to invest upfront in the state. He promised the highest standard of service delivery in the course of this pilot scheme and assured the Government of his company's commitment to operate within the ambits of professionalism. To ensure maximum delivery within the time framework of the exercise, Ofiyai informed the gathering of the secondment of several staff including Mr. Hakan Dal, Head of Technical Department of Alabayrak to Port Harcourt for training, capacity building and the assurance of international standard delivery. Speaking to news men at the event, Prince Tonye Princewill, facilitator of the partnership, stated that having seen for himself he had no doubt about Albayrak's competence, as a certified Prince 2 specialist Project manager; he said he had done a thorough study of the group portfolio and their ongoing retainer ships across major cities in the world before making his choice. He was impressed with their track record and was therefore optimistic that they could do same in River State if given the opportunity. From left - Mr. Hakan Dal from Albayrak Group. Commissioner of Environment, Hon. Barr. Kingsley Chinda. Prince Tonye Princewill. Prince Tonye Princewill, speaking at the presentation. From left - Mr. Basoene of the Ministry of Environment. Hakan Dal. Dr. Harrison. Hon. Barr. Kingsley Cinda, Commissioner of Environment. Prince Tonye Princewill. From left - Prince Tonye Princewill. Hon. Barr. Kingsley Chinda and Dr. Harrison with some of the technical staff of Albayrak Group. They will carry out the training of Nigerians. In the same vein, he spoke of his continued support for Amaechi's government not only in his capacity as Leader of the organised opposition in the Unity Government (FOOPP) but also in his supporting role in attracting Investor confidence back to the State. He further applauded Government's willingness to embrace the terms of the pilot scheme and hoped that at the end of this phase a larger framework will be put in place that would create job opportunities for indigenes and friends of the state.